I just got a new phone. In and of itself, this is not exciting news, but I got a new phone after using my old phone for 6 years—that’s eons in mobile phone time. My phone was so old that the young man at the mobile phone store laughed heartily when he saw it. “Wow,” he said, “how did you keep it working so long?” “The trick,” I replied, “is to never upgrade the operating system.” He looked at me like I was insane and shook his head. Sure, I lost use of certain apps over time and couldn’t engage in functions that many of my colleagues took for granted. But I like my phone, I would tell myself. I have a bunch accessories for it, I thought. The truth of the matter, though, was that I had created an array of increasingly complex and time-consuming workarounds to accommodate the phone’s growing limitations. When my phone would no longer hold a charge for more than 20 minutes, I knew it was time to give in and upgrade. My new phone is not just sleek and pretty; it has not required me to adjust. It is the tool I’ve needed for years with apps for tasks that I had been handling offline and the ability to support my creativity and productivity far beyond what I had imagined using its predecessor for. It is reliable, functional, and complete. This anecdote is much less a tale of technophobia or stubbornness than it is a parable through which you can consider the new National School Library Standards for Learners, School Librarians, and School Libraries—you may have been functioning just fine with older or other standards, developing workarounds and making excuses for their lack of fit to your current processes and needs. Don’t wait for those standards to completely stop working. Don’t accept standards that are “close enough” to what you do. The National School Library Standards (NSLS) are the exciting new tool you’ve been waiting for with features that work with you to enhance your life and practice. What’s Special about the National School Library Standards? Let’s start with the shiny new title. When the AASL Standards and Guidelines Editorial Board engaged groups of you from across the country, we heard remarkably consistent statements of value, tireless professional commitment, and vision. For this reason, it is time for us to call our professional compass National School Library Standards. While there are other sets of standards that may be helpful and speak to what we do, the NSLS was designed by us, and for us. The NSLS is our common ground, our anchor, our agreement about how to continue to grow and change. Because the school is a community, everything that happens in it is interdependent. Because we work across and in depth with so many groups in the school, our professional compass needs to reflect this complex, interconnected work while allowing for local priorities. The NSLS frameworks are linked through five components—Shared Foundations, Key Commitments, Domains, Competencies and Alignments—which are designed to reflect and reinforce each other. To ensure that we are guided by evidence and continuous improvement, we also developed a section dedicated to assessment and evaluation, examples of tools to align school and district models with the NSLS, and professional learning scenarios to study successful implementation in authentic situations. The NSLS offer many avenues for self-reflection, group professional development, and pre-service education. 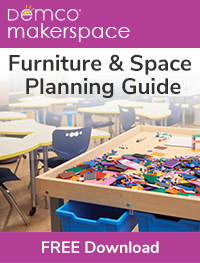 We even included are an extensive glossary of terms, useful verbs, a list of evidence, and other relevant appendices to meet a variety of implementation needs. What Can I Expect at the AASL National Conference Launch? This year’s AASL National Conference & Exhibition may be one of the most exciting school librarian focused learning events in some time. In addition to the many fascinating, timely, and innovative presentations, the standards editorial board (EB) and implementation task force (ITF) led several half-day preconference sessions for attendees. These sessions addressed a range of ways the NSLS can invigorate practice, guide learners’ growth, and transform school libraries. In concurrent sessions, EB and ITF members will give participants in-depth introductions to two shared foundations in each session with strategies and techniques for use. We are so pleased to provide you with a slew of resources to aid your orientation to and use of the NSLS. 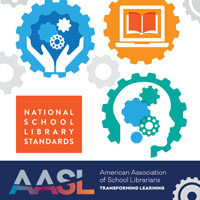 Visit the AASL Standards web portal at standards.aasl.org to see the latest additions to the videos, frameworks, and infographics that have been available for several weeks. View the Read more about NSLS on the ALA Store, and, for the first time, the NSLS are accompanied by a wonderful app for your mobile device. We also want to remind you of the highly anticipated free webinar event on November 16, 2017, at 6:00 p.m. Central. Over 400 of you have already registered to join an eCOLLAB session that will engage participants in an in-depth look at the NSLS development process and content. Since the webinar room has only 100 seats, if you want to participate live, be sure to login early to claim your spot! The eCOLLAB will also be recorded for everyone’s use afterward. 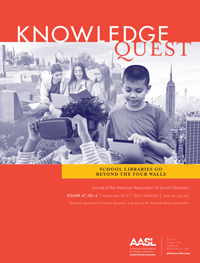 To find out more, visit www.ala.org/aasl/ecollab/standards. For the past 2.5 years, I have been honored to lead a group of innovative, wildly creative, and committed professionals through brainstorming, scanning, synthesizing, reflecting, and writing. Their tireless efforts culminated in a NSLS unlike the world has ever seen—and this is not hyperbole. No other school library community has produced a set of professional standards so complete, so interconnected, and so innovative—standards that are evolved, yet familiar. We know that you’ll be as proud as we are of OUR “new model,” and integrate the NSLS into your work life and practice. Even if you can’t join us at AASL National Conference, welcome your NSLS and keep driving innovation and change through the work you do with learners and the leadership you provide your communities!